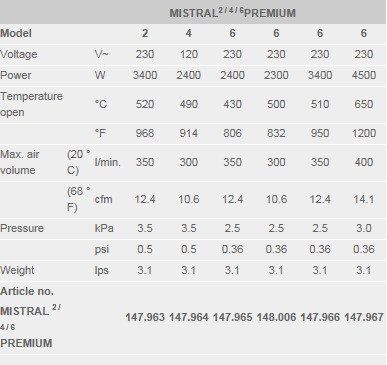 MISTRAL SYSTEM and PREMIUM Two model groups are available in this range – the MISTRAL 2 / 4 / 6 PREMIUM, and the top-of-the-range MISTRAL 6 SYSTEM. All MISTRAL 6 devices are equipped with a maintenance-free brushless blower motor, making them perfectly suited to continuous operation. 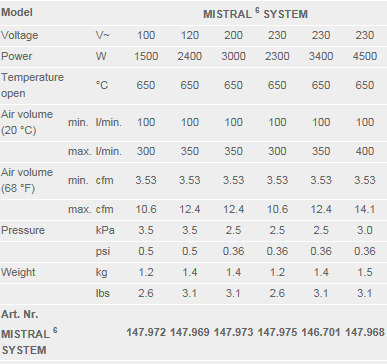 The MISTRAL 6 SYSTEM can either be operated using its integrated controls or via an external system interface. 1. Maintenance-free: Thanks to its brushless motor, the new MISTRAL 6 PREMIUM/SYSTEM is perfectly suited to continuous operation. 2. Innovative: Using the "e-drive" operating unit, the air volume and temperature for the MISTRAL SYSTEM can be adjusted to suit every application. 3. Fully-integrated: Main switch with integrated function pushbutton for programming (MISTRAL SYSTEM). 4. Multifaceted: Can be operated as a device with integrated control or via an external system interface for integration into a closed-loop system (MISTRAL SYSTEM). 5. Informed: Display with user status information and programming (MISTRAL SYSTEM). 6. Innovative design: Special diaphragm for an even airflow distribution and an optimized, aerodynamic airflow velocity. 7. Integrated: Thermal probe in the MISTRAL SYSTEM for enhanced precision. 8. Quick to connect: Thanks to the integrated air-hose connection adapter with its internal 1-inch thread, an additional adapter is not required. 9. Convenient: It is not only its state-of-the-art industrial design that is sure to impress, but also its convenient mounting tabs. 10. Automatic cooling: The MISTRAL SYSTEM is equipped with an automatic cool-down function. In the MISTRAL PREMIUM, the blowers and heating can be switched on and off separately.